Largemouth bass fishing is at its best in March and April. Areas of the lake protected from the north wind are an excellent place to look for spawning bass at this time of year. Spinner baits and soft plastics are excellent choices. From May through September, look for bass in downed timber next to the river channel. Spinner baits, buzz baits, chuggers, and plastic worms are popular baits. Crappie fishing can be quite good on Lake Brazos. White crappie predominate, but black crappie are occasionally caught. In the spring, from late February through April, crappie move into water less than two feet deep. The best places to look for spawning crappie are shallow flats next to creek channels. Keep moving to find concentrations of fish. Best catches are usually around standing timber, submerged brush, or aquatic vegetation. In summer, anglers fishing deep brush piles can be successful. 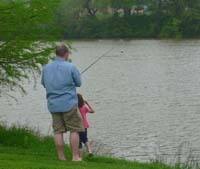 Fishing for channel catfish is generally best in the spring and early summer. Drift fishing from boats as well as bank fishing is popular among rod and reel anglers. Shrimp, blood bait, and stinkbait work well for channel catfish. Anglers after blues and flatheads have their best success with live shad, sunfish, or fresh cut bait. Larger blues are often caught in the winter months. White bass fishing is best from February through April. Spawning runs up the rivers result in dense concentrations of fish. Trolling or casting jigs and other small baits work well for these schooling fish. Sunfish can be caught using live worms or crickets most of the year, although late spring is best. Fish cover along the shoreline for best results, although bigger fish are usually found on submerged woody cover in deeper water.